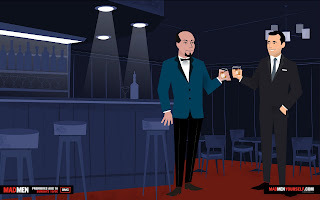 We are big fans of Mad men and now artist Dyna Moe has teamed up with AMC to let you "Mad Men Yourself" using attributes of her classic Jet Age style cartoons of the show! We first highlighted Dyna Moe's Mad Men Illustrated tributes back in October. Mad Men's third season begins on Sunday August 16 on AMC. The Original SALON Returns with a Swing and Loungerati is crafting the cocktails. It's a hot and steamy night in the city that never sleeps. Over at The Salon, the Harlem Renaissance Orchestra is swingin hard; the dames are breaking hearts and the gents are dressed to the nines. Rumor has it that on a night like this you could find Bogart, Bacall, or Sinatra at the Club. The only one missing... is you. courtesy of Sugar Shack Burlesque. Exquisite libations. Live music & Burlesque. the 10th Anniversary of the Piano Store! THE SALON: Lounging, Dancing & Swinging in Style since 2001. Loungerati friends Don Spiro and Diane Nagel are proud to present the monthly celebaration of jazz age debauchery on the Bowery called Wit's End. "In one of the hottest months of the year, we bring you the coolest cocktails and the hottest jazz, served up for you by The Red Hook Ramblers! They kept the crowd dancing in March, and now they're back for your toe tappin' pleasure! SPECIAL BONUS! We're so excited to be giving away TEN tickets to our Wit's End group to see one of our favorite bands, Squirrel Nut Zippers, at the Highline Ballroom on Sunday the 26th!! Come to Wit's End and we'll enter your name in a drawing to win one of five prizes (2 tickets each) to see this amazing show! Good Luck!! Be sure to join us at 8pm for a FREE dance lesson on Charleston with Neal Groothuis and Jeri Lynn Astra!! Band goes on promptly at 8:30pm! As always, enjoy our menu of vintage cocktails and haute chocolates from our favorite chocolatier, Chocolats Meurens!" A low lit sign that reads "BAR" lets you know you've arrived. Once inside the Dutch Kills bar in New York's Long Island City neighborhood, the thing that hits you is that someone has been paying attention to the details. Richie Boccato and his partner Sasha Petraske have been successfully getting the devil in the details right since they resurrected the art of cocktailing nearly ten years ago. I won't list the bars they have opened - you know what they are and understand their mission. But I can tell DK (as we call it) is Richie Boccato's baby. I am talking pride and joy. And he talks about the place like a gushing father. It all starts with the ice. When he talks about the process, you marvel at the knowledge of a true craftsman. Boccato and company brought fresh ingredients and artisanal liquors back to the bar. Now he aims to do the same for ice, and clearly he is not relying on the magical Kold Draft machine to keep your drink cold. Each day a 30 pound block of ice arrives at DK. They take an ice pick to the block and scar into eight sub pieces, then break it down further, until one gets the hand chipped piece that ends up making the cocktail. And it makes a difference. The solid chunk of hand cut ice melts slowly in your drink and certainly does not bruise the liquor. The result - a crisp refreshing drink that isn't watered down. The ice keeps the cocktail's consistency and taste profile throughout the imbibing experience. The attention to detail doesn't stop with the ice. You can see it in the hand typed menus. Hand typed on a vintage Soviet era East German typewriter. Yes, there is an umlaut key! Item: There is an ATM machine hidden inside a black wooden case in an alcove by the door hidden behind curtains. Item: There is a turn of the century saloon feel to it. From the saw dust on the floor, to dark varnished wood, intimate booths, high ceilings, and low lighting. Item: Five star cocktails at outerborough prices. Most of the specials (written on a chalk boards behind the bar) are nine semolians! That's right. Nine hundred pennies will get you a Queens Park Swizzle (Rum, Lime, Mint, Sugar, bitters)! Believe you me, these drinks are a steal. 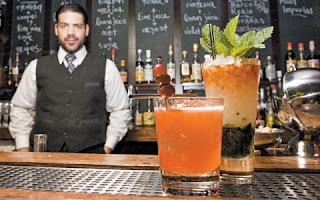 Item: World Class barkeeps - Giuseppe Gonzalez, formerly of Clover Club and Flatiron Lounge, and recent winner of the Tales of the Cocktail 'On the Fly Competition' is behind the stick with Boccato on most nights. 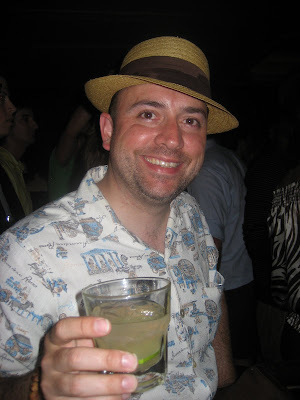 So is Alex Day of Franklin Mortgage Company in Philadelphia and Death & Company. The veterans and new bartenders like Amanda P and Abe keep the quality high and you staying for "one more." Once you have sampled the exquisite special cocktails. Go off menu. Get creative. Ask for a Charles H. Baker, Jr. classic such as Turf Cocktail No. 2 and get into a discussion on whether it is just another name for the Tuxedo. These fellows know their drinks history. Further, they can take you on a historical tour that will be a treat for your taste buds. Stir ingredients in bar glass and serve up in cocktail glass senza garnish. Build cocktail in a chilled rocks glass, add a hand carved block of ice, garnish with freshly cut lemon peel. For the Scottish Dandy substitute Chivas Regal for the Gin. 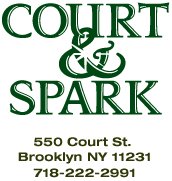 Court & Spark is the creation of local favorites and world-class bartenders Jimmy Drago (Brooklyn Social) and Henry Lopez (Bar Blanco) and offers a cocktail-centric experience in a casual setting with some of the freshest and more original cocktails in all of Brooklyn. Located on the border of Carrol Gardens and Red Hook in one of Brooklyn's fastest growing areas, C & S opened it's doors in December of 2008, proudly joining the rich fabric of one of New York's most historically significant neighborhoods. So come experience the excitement and unique tranquility of south Court street. Their Summer Menu looks refreshing and they serve small plates late in a convivial atmosphere. The cocktail tasting lasts from 6-8pm and then there is an Open Mic night. 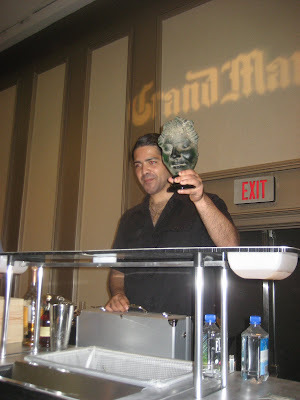 I arrived at Harrah's Theatre early, lost $20 at slots, then got on line for the weekend's grande finale - 3rd annual Tales of the Cocktail Spirit Awards sponsored by Pernod Ricard USA. I sampled the bar, chatted with a few soon to be winners, grabbed a Blood and Sand, and a seat with a crew of mixologists from Drink Boston. After a whopping set of introductions by funny man Billy Harris, The Tuennermans & Co, and cocktail author Simon Difford, the Spirit Awards were handed out. It is clear the New York is still Cocktail Central in 2009! Loungerati is especially proud of our local favorite, The Clover Club. Julie made the trip just in case she won, well congrats!!! I woke up pretty early (10am) considering the events of the night before. 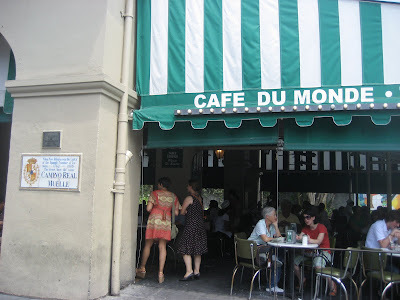 My head was buzzing as I walked down to Café du Monde for touristy beignets and cafe au lait. They were "OK." I later found a better place for beignets downtown near the hotel called Café Beignet. So after a not satisfying breakfast, I headed back to Hotel Monteleone for a Bloody Mary at the Carousel Bar. Sadly, I had missed my morning seminar but was soon surrounded by Tales goers - aka a whose who of the industry! 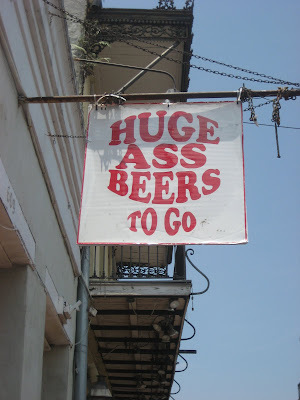 So, I washed down the hair of the dog and decided to spend the day walking around the French Quarter. 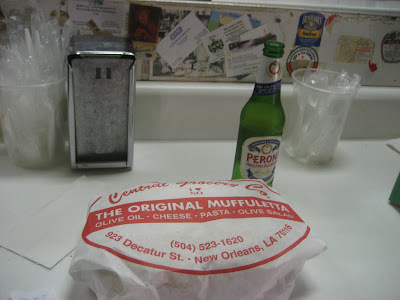 Walked down Bourbon Street, headed over to Central Grocery at 923 Decatur Street for an original Muffaletta (A circular loaf of soft Italian bread is sliced horizontally and piled with salami, ham, and provolone, chopped green and black olives fragrant with anchovies and garlic)and a Peroni. Then went to Saint Louis RC Church for penance. 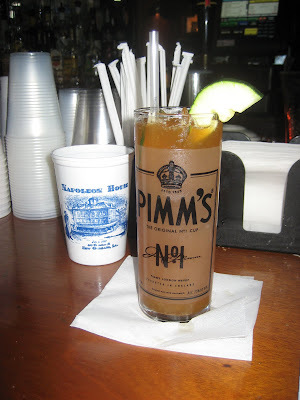 After lunch followed by a few Hail Mary's, I hit Napoleon House for a their house specialty, the Pimms Cup. What a classic venue! The peeling paint is the real macoy, so is the bar staff, the food, and Southern hospitality. 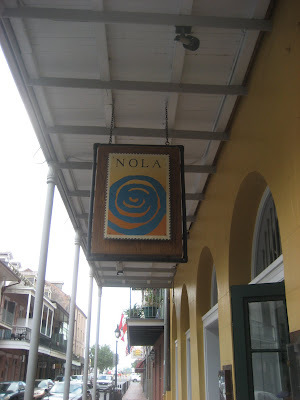 The Napoleon House is a historic Vieux Carre bar that has been slinging cocktails since 1797. Wait, that was before Napoleon!! But whose fact checking after a few Pimms Cups? What a lovely place. Chatted up the bartender about various Pimms Cup variations, and walked away with a souvenir Pimms Collins glass.Yes, I paid for it (this time). Back to the Carousel Bar where I met with Peche Austin crowd. Good guys who love the craft. Now Austin is a cocktail destination. Meanwhile, Danny Devito was hawking his Lemoncello (yes that is how he spells it) on the Chef and the Fatman live radio broadcast being filmed behind the bar at Monteleone. Every 15 minutes my seat would move toward the chaos of the radio show and then back around. Surreal. After a few go rounds, I decided to retire to the Iberville Suites and take a nap before dinner. Grabbed dinner at Emeril Lagasse's NOLA. My friend Mona used to bartend at NOLA and sure enough the head bartender, Dean not only remembered her but is still a best friend. Naturally, I got the royale treatment. I opted for the tasting menu with wine pairing (only $55!). Next stop, the W Hotel across Canal Street for a competition. 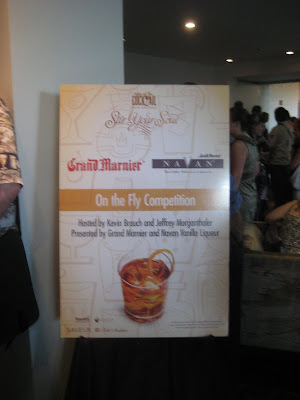 The "On the Fly Competition", sponsored by Grand Marnier and Navan Vanilla liqueur was MC'd by cocktail blogger Jeffrey Morganthaler. The judges were straight out of a cocktail legends playbook - Tony Abou-Ganim, Bridget Albert, Antoine Gervais, Xavier Herit, Francesco Lafranconi and King Cocktail Dale DeGroff. Ingredients included everything from Tea Forte to BBQ sauce, and the only other catch was that they had to use ½ oz. of either Grand Marnier or Navan. They had thirty minutes to do their work. 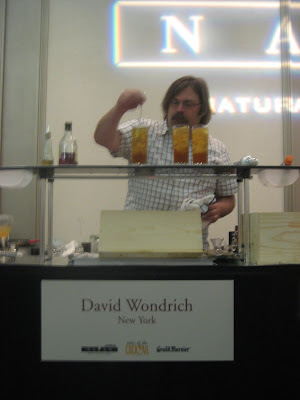 Had fun rooting for NYC and what do you know, Giuseppe got the win with his epic Trinidad Sour. Sat with Josh Linson of Tea Forte showing baby pics and discuss cocktails (what else? 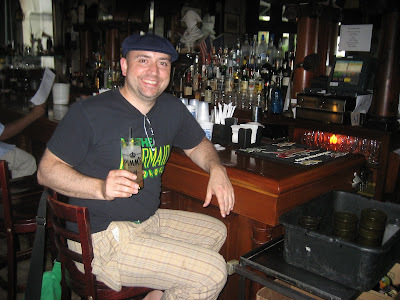 ), then shared a cab across town to Pat O's with some LA bartenders and the truly charming Cheryl Charming. She busted out the iPhone and showed off the Hollywood Cocktails app. 5,000 bar questions, take that Trivial Pursuit! USBG Leblon Cachaca competition at Pat O's on the water. United States Bartenders Guild had 18 bartenders from 9 cities represent their chapter to compete for the top prize and a golden muddler to bring back to the winning city. 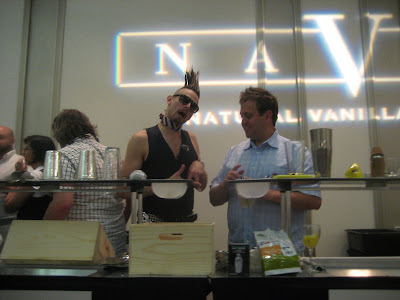 Winners this year were Peoples Choice: Tad Carducci (The Tippling Brothers) and Judges Choice: USBG Las Vegas Chapter which was composed of Tobin Ellis and Andrew Pollard. Tippling brother Tad Carducci (New York) had the winning cocktail! Masalarinha - A fragrant, Indian-Inspired Caipirinha. Muddle lime, pineapple and honey. Add additional ingredients and ice. Shake and serve over ice. Combine all ingredients in mixing glass. Add ice, shake and then strain. Top with 3/8” Lemon Espuma. Sprinkle with dash of cardamom dust. Etch rosetta pattern with Apricot Coulis. *Lemon Espuma: In Dessert Whip add 4 oz. fresh lemon juice, 4 oz. pure cane syrup, 4 oz. egg white. Charge mixture with 1 NO2, shake and chill. New Orleans is HOT and by HOT I mean clothes stick to you HOT even in the shade. Occasionally, a thunderstorm rolls through and dribbles rain drops on your body. 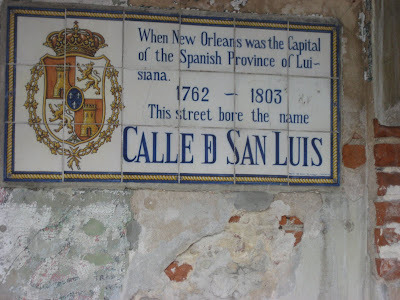 When you are out walking around the Vieux Carré , you actually hope it rains. This my friends is the opposite from New York which is going through an unprecedented monsoon season. So Day one. What happened? Where did I go? And more importantly what did I imbibe? Oh it was on! I love the expression on fellow passengers' faces when I bust out the Flight 001 - To Go Bottles. It is a mixture of surprise and admiration. Yes, I am not supposed to smuggle booze on the plane but < I am using TSA approved portion sized plastic bottles. So is it really wrong? At the end of the day, I am have a proper cocktail - gratis - while you are drinking Sierra Mist. I looked around the plane and there were many important industry folks including Phil Ward (Death & Co), the molecular mixology trio Eben Freeman (Tailor), Dave Arnold (French Culinary Institute), and Johnny Iuzzini (Jean Georges), and a half dozen others I recognized. I was traveling in good company. Ok, back to Tales of the Cocktail. 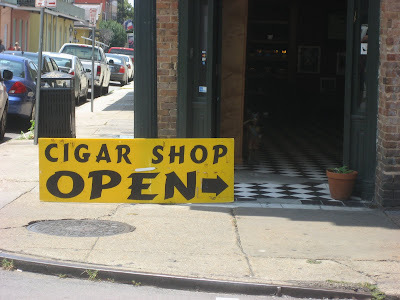 Once I arrived, I cabbed it to the Iberville Suites, checked in, and made my way to Meyer the Hat on St. Charles to purchase a straw pork pie fedora. This is my ritual when I am in New Orleans. Meyer the Hat is an institution in this town and clearly I need head gear to protect my chrome dome from the blistering sun. So I bought a Biltmore Milan model on sale! Next stop was Tales of the Cocktail central aka the Hotel Monteleone. I "checked in" with the Tales folks which was simple since I had not provided press credentials. 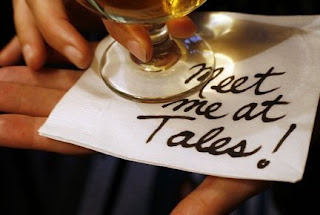 Next year, I need to send it by March to be considered an official Tales blogger. So they gave me a To Go Cup, a swizzle stick, an events calendar and sent me on my way. No drink voucher? Hrmph! So I left the hectic scene at Hotel Monteleone and grabbed lunch at Acme Oyster House down the block on Iberville Street. I hit this place whenever I am in town, plus they don't serve lunch on the plane these days. 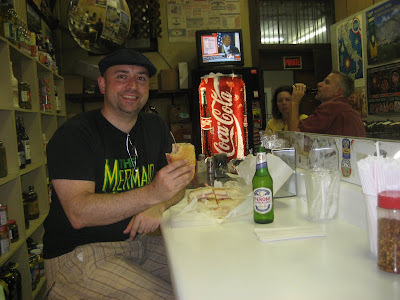 So I ignored the "Don't eat oysters unless the month ends with an R" rule and ordered a dozen, a shrimp po' boy, and an Abita beer. It was friggin good. 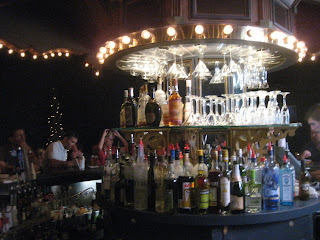 Ahh - finally satiated I headed back to Hotel Monteleone for kick off drinks at the famous Carousel Bar. Combine in Old Fashioned glass, stir, then squeeze lemon twist and drop in glass. Once sorted out and bit dizzy from the ride, I retreated to my hotel room and prepared for dinner. White cotton dress shirt french cuffs, white chinos, blue silk Gucci ascot, black wing tips (sans socks), the blue/white seersucker blazer, and the new lid. In other words, Southern Gentlemen Lawyer type causal (no tie) for evening aperitifs! - Discussing The Flip with THE Wayne Curtis, author of "And a Bottle of Rum: A History of the New World in Ten Cocktails"
- Meeting New Orleans radio personality Tim McNally and his crew. They really made me feel at home and from now on I will have to refer to a seersucker jacket as a "Haspel." It was a real treat to mingle and talk with so many talented bartenders and cocktail aficionados. Properly toasted, I strolled down to the water to IRIS for a Spirited Dinner. Allen Katz beverage director of Southern Wines & Spirits was mixing up cocktail pairings with dinner. So I took a bar seat and had a bird's eye of the master at work. Poppy's Choice was by far my favorite drink (Gin, VEP Chartreuse, Lillet blanc)! This gem was a stiff yet crisp aperitif. Allen did not stop there, the cocktails were almost two for every one entree which in my opinion is a damn good value for $100. Excellent New Cajun food, outstanding service, and drinks for the ages. A perfect evening. Ended up at Vaughan's Lounge in the Bywater section. 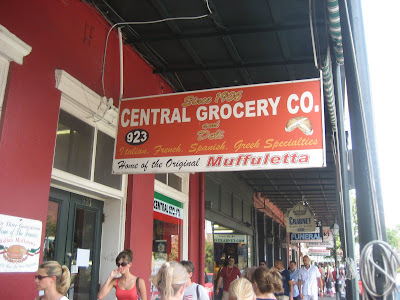 This place seemed like 15 minute cab ride and I knew that I was in the real New Orleans. No fancy hanging gardens or stumbling tourists out here (except me). Thursday nights is when trumpet player Kermit Ruffins and the Barbecue Swingers play so I wanted to check it out this NOLA institution. The music was jumping, the crowd friendly and spirited. I met the DrinkBoston crowd. After 3am shots of Green Chartreuse I knew I was in trouble. So I summoned what strength I had left and flagged a cab. I have to admit that liquor muscles or not, I was worried because I felt like it was the middle of no where and had no idea how to get home. By the grace of God, I was able to get out in one piece and back to "the Quarter". Next year, go to Vaughan's early and with numbers! What a great time - and this was one DAY ONE! 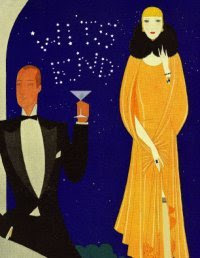 JC Hopkins and Gemini & Scorpio present the Nouvelle Époque party at the historic Players Club on July 17th. Fredo from Loungerati has crafted a specialty cocktail menu for the soiree. The legendary Players, boasting such luminary members as Mark Twain, Eugene O'Neill and Ernest Hemingway,is a members-only social club founded by the famed 19th century Shakespearean actor Edwin Booth. The Players' landmarked home is a magnificent Victorian mansion with a wrought-iron balcony overlooking Gramercy Park. The Slipper Room's illustrious owner James Habacker presents (and hosts, in guise of Chester Mackerel, charming professor of abnormal psychology), a night of exuberant entertainment to ignite the senses. 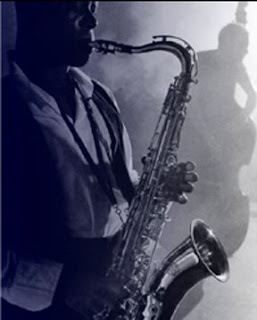 JC Hopkins' Biggish Band plays rollicking hard bop swing all night featuring guest vocalists tap-dancing sensation DeWitt Fleming Jr, velvet-voiced Jolie Holland, and Tony-nominated downtown icon Justin Bond, in addition to JC's resident front-woman Queen Esther. The always-surprising Julie Atlas Muz (Miss Exotic World 2006), the jaw-droppingly stylish MsTickle, and hilariously naughty Trixie Little & Evil Hate Monkey perform feats of burlesque to live accompaniment by the band all night. In band breaks, 1920s tap sensation The Minsky Sisters amuse and titillate you. The cabaret runs 9pm-1am in the formal Dining Room, preceded at 8:30pm by a complimentary dance class. After the cabaret, DJ Shakey spins a most unique mix of vintage + modern beats to keep you dancing. After 9pm, the Sargent Room across The Great Hall, named after its three John Singer Sargent portraits (he was an early member), is your salon for cocktails and conversations, as jazz pianist Jesse Gelber sets the elegant mood. A custom cocktail menu will be crafted for Nouvelle Époque by Fredo of Loungerati.com. The Sargent Room and its park-facing balcony are reserved for VIP guests 7-9pm for a cocktail reception and a private performance by San Francisco opera diva Marisa Lenhardt, as stylish cigarette girls treat you to hand-rolled cigars and hand-dipped chocolates, courtesy of Velvet Cigars and Desserts by Michael Allen. 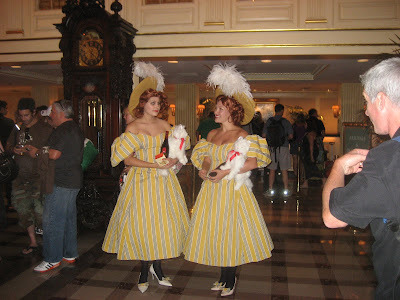 Belle Epoque - late 1800s to WWI, evening glamour, top hats + tails, feathers + gloves, outdo yourself at your most fabulous.